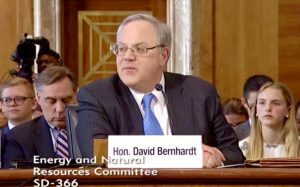 Rifle homeboy David Bernhardt skated through his Senate confirmation hearing Thursday to take the reins as secretary of the Interior Department. He showed those Beltway insiders a confident Coloradan who stands firm in his ethical roots, and isn’t afraid to defend western issues that seem foreign to most easterners. President Trump named Bernhardt acting secretary after Ryan Zinke resigned. Comically, the best some Democrats could do was question Bernhardt why he didn’t stop his former boss from being the boss and making decisions. Gardner cited Bernhardt’s extensive insight into western water policy, natural resources, conservation, endangered species, and Indian affairs just to name a few. Even the panel’s ranking Democrat, Sen. Joe Manchin of West Virginia, had complimentary comments about the Republican nominee. The Senate is expect to confirm Bernhardt’s nomination, even as his other home state Senator, Michael Bennet, has pledged to vote against his constituent. « BLIND ITEM: Geitner Accuses Democratic Legislator of Illegal Threats – But Who?